As a long time Maemo user (OS2007 on a Nokia n800, OS2008 on a Nokia N810 and Maemo 5 on a Nokia n900) and really like having an open Linux mobile platform. Even though I get shorted on all the Android apps out there I have virtually everything I need (short of Yelp and OneBusAway apps) and a whole lot more. Having a full featured Linux OS on my phone is very useful for a variety of reasons one of which I get a real terminal. I have an app that uses rsync to synchronize my media server to my phone so I never have to manage my music/podcasts via the mobile interface. Multitasking on the n900 is amazing in comparison to Apple's iOS or Android. However, the n900 keeps getting older and I'd like to have something newer. I'm not about to give up my awesome mobile OS though for a nice piece of hardware running a Java stack. Let's not forget that Nokia make phenomenal hardware even if it was expensive. Their stuff is rock solid and I've had to reboot my n900 fewer times in the last 18 months than I did per week on my Android 2.2 phone. With all of that in mind I've been waiting for a replacement for Maemo 5. Nokia was working on Maemo 6 then merged their efforts with Intel's Moblin which proved to be a disaster. It took an extra 2 years to get nowhere before Meego 1.2 was released. Nokia put it on one phone, the n9 (which I'd still like to have) and then abandoned it. Intel then announced it was going to carry the torch alone which nobody believed since Intel can't design a piece of software to save their lives. Soon after they too abandoned it. The community project of Mer picked up the source code and started working on it which was supposed to be used by the Vivaldi tablet which never went anywhere. Intel then partnered with Samsung to work on Tizen which hasn't gone anywhere either. So where does this leave me? Using my couple year old n900 for a bit longer. However, there may be yet another ray of hope (but I'm not holding my breath) - Sailfish OS. Apparently Sailfish OS from Jola is based on MeeGo but I'm not sure if it's using the Mer codebase or they forked it from MeeGo. Here's a video of Sailfish OS running on a Nokia n950 (my dream phone) and it looks pretty neat. They're saying that they will be able to release in early 2013. Until I see something I can buy or use I'll wait patiently and try not to get too excited. Installing from an XCP/Xenserver template usually gives you one Virtual Disk to install the operating system on. Depending on your needs this disk may not be large enough. Following is a tutorial on how to add an additional disk to a virtual machine. Virtual Machine - A virtual machine is a computer that's virtualized and running on a hypervisor. In our case the hypervisor is Xen Cloud Platform/Xenserver. The Virtual Machine can be running any operating system. Virtual Disk Image - Think of a Virtual Disk Image as a hard drive. Storage Repository - A "box" storing Virtual Disk Images. Think of this as an external box storing virtual hard drives. The virtual hard drives are the Virtual Disk Images mentioned above. 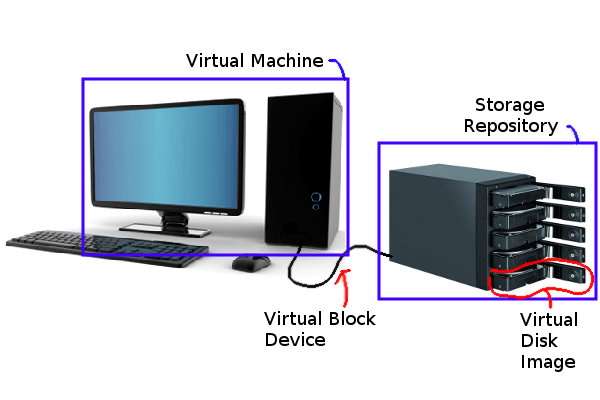 Virtual Block Device - A Virtual Block Device connects a Virtual Disk Image to a Virtual Machine. In traditional computer terms you could think of it as the cable. You will need to know how much free space is available on your Storage Repository. Now that we have the Storage Repository's UUID number (36bf480a-5df9-4453-50f0-2bac4a86cb42) we can use xe sr-list again to give us the physical size and how much space is being utilized. Quick math (991600574464 - 214752559104 = 776848015360) shows us that we have about 776 MB free. Now that we know the available space on the storage repository we can make a new Virtual Disk Image using xe vdi-create. This command outputs the VDI's UUID. You can get information about any VDI using the xe vdi-list command. The result of xe vm-list shows that the virtual size of the VDI is about 100 GB and it's name-label is DATADISK. To add this new disk to a VM I'll need to get the VM's UUID number by using xe vm-list. We will also need to know which Virtual Block Device numbers are available. We can use the xe vm-param-get command for this. Create the Virtual Block Device (VBD) using the xe vbd-create command and the VM UUID, VDI UUID and the first available VBD number. I created Virtual Block Device 7 (device=7). Using device=0 would have given me a /dev/dev/xvda which I already have. The xe-param-get command showed my first available Virtual Block Device number was 7. Notice that we associated the Virtual Disk Image (VDI) to the Virtual Machine (VM) by using a Virtual Block Device (VBD). The VM won't see the disk yet as it hasn't been "plugged in". We can do this by either rebooting the VM or using the xe vbd-plug command. Let's plug the VBD into the running VM. Log into the VM via ssh or xenconsole and see if the disk appeared by catting /proc/partitions. In this case the name is CentOS6 and the UUID is cefb9f88-0424-6701-5ba1-070490c69203. In this case our disk is named CentOS-6.3-x86_64-LiveCD.iso. Use the VM UUID that we retrieved in step 1. 4. Add the CD to the VM. Use the VM UUID from step 1, the CD name from step 2 and the VBD device number from step 3. By using xe vm-cd-list we can list the CD's currently plugged into our VM. When done with the CD you can unplug it even easier. We specify the VM UUID and tell it to eject the CD which it does. Utilizing an ISO image in a VM's cdrom drive is fairly easy to do but because of the limited size of the Control Domain's (dom0) operating system partition it's difficult to download ISO images to /opt/xensource/packages/iso and it isn't really recommended to put them there anyway. In this tutorial we'll create a CD repository using an local Logical Volume. First we need to know the name of the LVM Volume Group. This is taken from the Storage Repository's UUID. To get this we'll use xe host-list. Using xe sr-list type=lvm shows only our local Storage Repository which has the UUID of 36bf480a-5df9-4453-50f0-2bac4a86cb42. We'll now use the vgs command to give us the names of all Volume Groups including VG_XenStorage-36bf480a-5df9-4453-50f0-2bac4a86cb42 which matches our SR UUID. Utilizing an ISO image in a VM's cdrom drive is fairly easy to do but because of the limited size of the Control Domain's (dom0) operating system partition it's difficult to download ISO images to /opt/xensource/packages/iso and it isn't really recommended to put them there anyway. In this tutorial we'll create a CD repository using an NFS share. In our example we'll be using a share on the cloud0 host named /media/NFSISO. To set this up on cloud0 you'd log into cloud0 as root and add this line to the /etc/exports file of your NFS server. I'd recommend that you secure your NFS share more tightly than I've done here but for the purpose of this tutorial we'll go with it. We need to make a directory that we can mount our NFS share on first. Sometimes I get a stuck Virtual Machine that just won't go down and it's usually due to a lack of memory in the VM. When I issue a shutdown command from within the VM it starts the shutdown process but hangs part way through. Executing xe vm-shutdown --force uuid=<insert UUID here> does nothing but lock up the terminal. If this happens to you follow the steps below to forcefully shut the VM down. This will canceling the tasks that may be locking any new tasks e.g. the shutdown commands, destroying the domain and then shutting the VM down. I've had to do this several times on an Apache webserver that's getting pummeled from the Internet. The steps above in script form (if you trust me). Step one has to be entered in manually. The rest can be copied and pasted.